Ahmedabad, 5th February, 2019: With a view to boost women empowerment and ensure greater representation and participation of women in the Parliament and civic bodies, the National Women’s Party (NWP) has already launched in Delhi, Karnataka, Maharashtra and Tamil Nadu in January 2019. 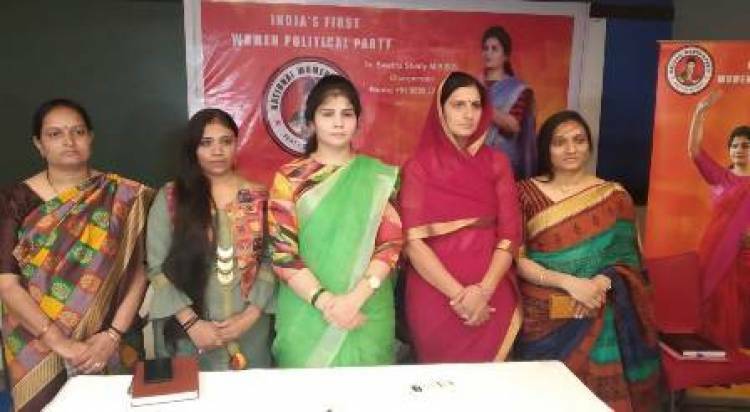 Carrying its noble agenda forward of removing gender disparity in Indian Politics and expanding on a Pan-India level, the party's Ahmedabad unit was launched on February 5. “For many years since independence, a predominantly patriarchal society has ensured that women remain grossly under-represented in civic bodies and do not have key decision-making powers. With the formation of NWP, we aim to create a legitimate platform to give voice to the silent aspirations of women and create sustainable pathways to empower them in their endeavor to seek their own development and growth potential. We demand nothing less than 50% reservation for women in Parliament,” stated Dr SwethaShetty, MBBS,Chairperson, National Women's Party. “The need to analyze problems of women on a statewide basis and form state-focused strategies has prompted us to open NWP units in key states like Gujarat. If we examine data tabulated from the last state assembly elections held in Gujarat in December 2017, it is clear that the percentage of elected women in the state assembly has been at its lowest. Gujarat remains a case point in decoding the dynamics of expanding gender gaps in Indian politics. We aim to address this lacuna and ensure that there is a substantial increase in the number of women in civic bodies, state assemblies and the Parliament,” added Dr Shetty. The party, comprising eminent women from all walks of life, will also endeavor to start Youth Parliaments (political schools for women) in every state for nurturing political awareness from an early age and training & encouraging them to become a part of the country’s political process. The NWP, which will be contesting 283 LokSabha seats-half of total seats- in the upcoming LokSabha elections, believes that electoral power is the medium through which the party can effectively redress the grievances of women and make them central to state and national politics.